Few dishes have the crossover appeal of steak frites. Its building blocks – beef, potatoes and some iteration of a mother sauce – have the kind of safe, mass appeal of an entrée shaped from a series of corporate focus group sessions. Yet it’s the variations possible on these basic themes where the true refinements and creativity come into play. Sometimes called “America’s Favorite French Dish,” it often serves as a canvas for chefs to play around with a blue chip dish in a way that, say, an entrée of chicken breast something-something never could. And unlike the chicken breast, this is a dish that chefs will gladly sit down to eat. It is comfort food that will always have a place on even the ritziest of menus. Here are a few of the variations you can find around town. John Harris features an excellent version of the dish on his menu at Lilette. “Steak frites is one of those dishes I’d see in all the French Bistros when I worked in Paris,” Harris says. “It is just classic French.” His take is traditional; distinguished by an excellent bordelaise sauce beefed up with marrow. Hanger steak is the cut of choice and his frites are tossed in garlic butter right before they come to the table. But for Harris, the sauce is key. It starts with his veal stock reduction, made ahead of time and kept on-hand for service. When the ticket comes in he sautés garlic, thyme, shallot and butter, then hits it with the reduction. A few disks of beef marrow held in ice water go into the saucepan for the last few seconds before coming off the fire. The result is a marrow-infused Bordelaise sauce with incredible depth of flavor. Eaten either in either the bustling main dining room or al fresco in Lilette’s charming side patio, the dish is transporting. Jason Goodenough, the chef and owner of Carrollton Market in the Riverbend, has a soft spot for the dish as well. 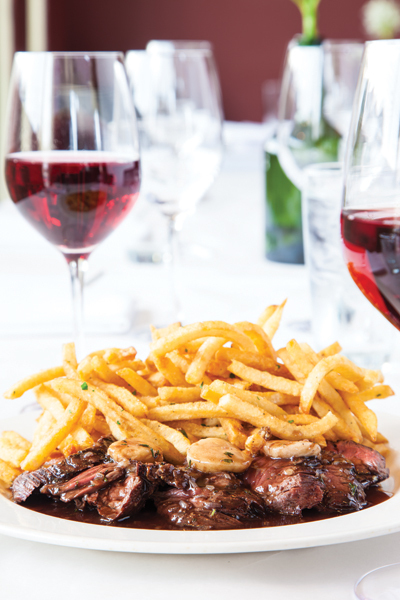 “Steak frites is one of my favorite things to eat,” he says. “It is just one of those dishes that I think is such a stand-by – it’s “quote unquote” simple but, really, it isn’t. There are so many variables that go into it.” Goodenough takes a more flexible approach, most notably swapping out the hanger steak for a New York Strip. Goodenough toyed with a bunch of different cuts including hanger, flatiron and skirt before making up his mind. His reasoning was better consistency and control over the final doneness. “With hanger, the portions coming in were often long and thin but then thick in other places – it was hard to catch a consistent temp all the way though on the line,” he explains. For his version, Goodenough brings in the whole strip loin and breaks it down in house. Trimming it to a uniform thickness helps on the line. John Besh’s Lüke in the CBD offers a brawny version featuring rib-eye finished with maître d’hôtel compound butter along with béarnaise or a sour-mash steak sauce for the house-cut fries. A jumbo lump crabmeat supplement puts it over-the-top. Or head to La Boca, where you can assemble your own from their excellent Vacio flank steak and an `a la carte order of garlicy frites. For service, the portioned strip is pan-roasted then finished in the oven to desired doneness, then plated with house-cut frites that are first blanched then fried. His also comes with two sauces, a rich demi-glace for the steak and a New Orleans-style béarnaise – essentially hollandaise with tarragon – for the fries. Carrollton Market offers seating at a short bar overlooking the open kitchen if you want to see the crew at work, or else grab a seat in the tastefully contemporary dining room. Food memories associated with the dish for Goodenough include the version served at Balthazar in his native New York – “I love the way they do it there – I get it every time I go,” Goodenough says. The distinctive licorice-like note of tarragon is also a feature in a variation served at Toast, Cara Benson’s Uptown offshoot of her popular Tartine. Toast is primarily a breakfast and brunch destination, specializing in pancakes, aebelskivers and yes, toast, but Benson’s short list of entrées includes a dish of hanger steak with Lyonnaise potatoes and tarragon aioli. It makes for a popular crossover option for those wanting something more substantial than the typical breakfast and brunch fix. Eggs sunny-side up makes for an especially rich rendition. For the version served at La Crepe Nanou, the more traditional hanger steak is swapped out with filet mignon, and the diner gets to choose which sauce will accompany the dish. Béarnaise, cognac, mushroom and garlic are all options. This mix-and-match take is a less composed version than the ones found at Lilette and Carrollton Market, but some diners likely appreciate the choice. And for Parisian feel, few places capture the intimacy more than this Uptown crêperie.